On Thursday, Feb. 21, the Cockrell School of Engineering celebrated the launch of Texas Inventionworks — a program established to introduce innovation and hands-on engineering experiences to all students, creating a new, systematic pathway for them to learn, solve problems, develop products and ultimately launch ventures. Texas Inventionworks evolved from the Cockrell School’s Longhorn Maker Studio, the school’s first makerspace and open prototyping lab that opened in the basement of the Engineering Teaching Center in 2014. What began in that single, 1,700-square-foot lab has grown into an expansive, multifaceted program with a focus on six interconnected initiatives: a curriculum lab for professors; education in design, fabrication and innovation; an innovation accelerator; student access to state-of-the-art facilities and equipment; research partnerships; and engagement with industry. The program is now headquartered in the National Instruments Student Project Center, right in the heart of the new Engineering Education and Research Center. Texas Inventionworks also grew out of the Cockrell School’s commitment to advancing engineering education and shaping the next generation of engineering leaders who can make an impact right away upon graduation. Texas Inventionworks coaches students through their progression from ideas to realities and from initial drawings to fully functional machines. The program’s student-led projects come in different forms and address a variety of challenges — from the development of robots that can draw on large glass windows or move machines and supplies between labs to a new long-range T-shirt cannon for future Longhorn football games and a new type of wheelchair invented to eliminate pressure sores, an ailment that causes thousands of deaths every year. Texas Inventionworks has been made possible by generous donations of time, funds and equipment from a passionate community of alumni, industry partners, faculty and current students. It is open to all Texas Engineering students and faculty members and to various multidisciplinary courses and innovation projects, and it is actively seeking new industry and research partnerships that can both enhance the student experience and help advance marketable technologies. 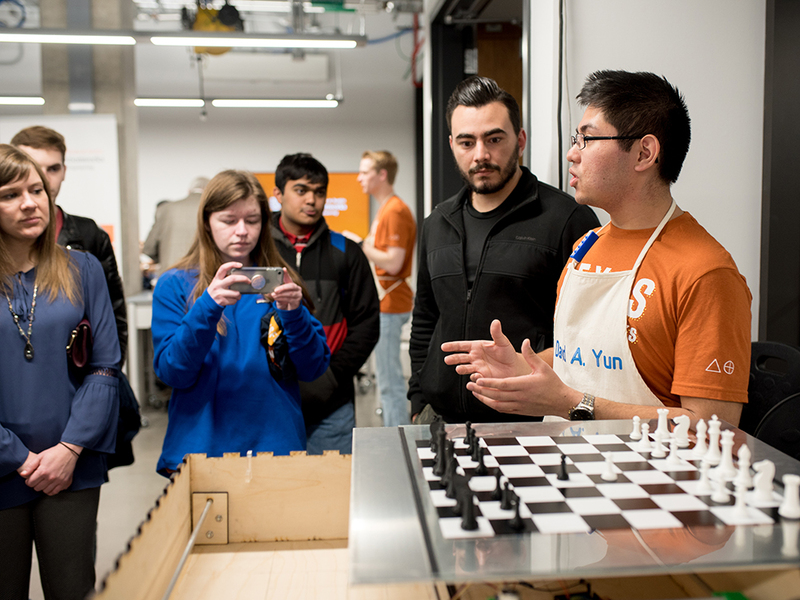 The launch event included an open house for the Texas Engineering community with opportunities to tour the National Instruments Student Project Center and learn about a variety of student-led projects.